A careful investigation of Kenya’s Mau Mau uprising and the manifold crimes by the British colonial government in attempting to suppress it. Half a century ago, tales of Mau Mau atrocities filled the world’s newspapers, along with lurid photographs depicting butchered innocents and ransacked farms. Such atrocities did occur over the decade-long course of the uprising, writes Elkins (History/Harvard). But she opens long-closed files in British archives—those that survived a systematic effort to destroy them—to reveal that greater atrocities were committed by the colonial regime, which was ill-equipped to understand, much less accommodate, the demands of the native Kikuyu. Inspired by such leaders as Jomo Kenyatta, who spent most of the uprising in prison, the Kikuyu of northern Kenya had taken to resisting the colonial government with various levels of violence, an effort that the government averred was meant to expel all Europeans from the country. Elkins observes that nonindigenous society was sharply divided among very wealthy landowners, who tended to be English, and much less affluent farmers whose parents and grandparents had come from South Africa during the Boer War, bringing the doctrine of white racial superiority with them. From their ranks, using tactics tried in Malaya and elsewhere in the colonial empire, the aristocratic government drew recruits for police and military units that went to work burning villages, relocating their residents to concentration camps, and rounding up and executing suspected Mau Mau. Less concerned with restoring order than subduing the population, the British colonial government and army allowed these Home Guard units free hand. “None of the high-ranking officials . 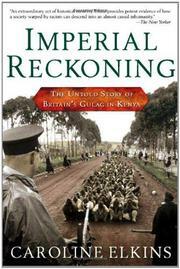 . . actually believed that the standards of British law applied to Africa,” Elkins writes, “and particularly not while they were fighting a war against savagery.” In her estimation as many as 100,000 Kikuyu died, making the war against them one of the bloodiest in European colonial history. Sure to touch off scholarly debate and renew interest in recent, deliberately forgotten history.